The AW-HE40 pan/tilt/zoom camera incorporates newly-developed 1/2.3-type full HD MOS sensors and Digital Signal Processors (DSP) for high sensitivity, high resolution and superior video capture in a wide range of shooting conditions. For a limited time, purchase an AW-HE40H from a participating authorized Panasonic reseller to take advantage of $300 instant savings! * HDCP is not supported. * VIERA Link is not supported. Note * 1: It may be necessary to upgrade the version of the controller so that the controller will support the unit. * 2: During Auto, 6 dB to 48 dB (6 dB step) are available for AGC Max Gain setting. * 3: During Auto, 0 dB, 6 dB, 12 dB and 18 dB are available for Auto F.Mix Max Gain setting. * 5: To ensure safety, the unit must be secured using the mount bracket supplied. * 6: Depending on the pan or tilt position, the camera may be reflected in the image. * 7: Use of an STP (shielded twisted pair) cable is recommended. * 8: To ensure more safety, AW-HE40 series can be secured by using the direct ceiling mount bracket (WV-Q105A). Enter the World of P.T.Z. The HE40 camera is designed to produce great results in a variety of applications that require high-quality video and precise control—such as conference video, event capture, staging, distance learning and houses-of-worship. Thanks to their precision 30X optical zoom lenses, wide field of view, smooth PTZ functions and exceptional image quality, HE40 cameras are ideal for demanding remote production and IMAG use. With IP-Preview transmission and control, and support for PoE+ (which allows power to be supplied via a LAN cable), the HE40 also offers the flexibility needed for easy installation and management. In addition to a 30x optical zoom, the HE40 also features intelligent zoom up to 40x and a 1.4x digital extender to capture crisp close-ups even in large auditoriums and lecture halls. The HE40 delivers an impressive signal-to-noise ratio of 54dB (F4/2000lx, minimum illumination, .35 lx), 1000 TV lines of resolution and 16-axis color matrix control for precise camera “painting” and matching. The HE40 already includes many innovative standard features developed to expand the capabilities of professional video system users. In addition to Panasonic's Dynamic Range Stretch (DRS) and advanced Digital Noise Reduction (DNR), an ingenious High Dynamic Range (HDR) mode helps to produce very good video even in extreme contrast and lighting conditions. For shooting in virtually total darkness, the HE40's Night Mode makes it possible to automatically switch to the capture of high-quality, HD monochrome video with the use of an (optional) IR illuminator in the 850nm range, making the camera ideal for reality show production, sleep lab research and staging support. to remote control operation. They operate quietly at a sound level of NC35 or lower. Up to 100 preset positions and camera settings are stored in the camera, more than enough for the most demanding large venue installation. The camera weighs only 3.3 lbs. and consumes just over 14.4 watts at 12 VDC. USB or microSD Card Recording: The mini-USB connector allows the AW-HE40 to be utilized as a USB camera utilizing standard USB Video/Audio class drivers. Many applications that connect to USB cameras, such as teleconferencing or software switching solutions, will be able to connect to the HE40 without external converters. Alternatively, microSD recording enables ISO MP4/H.264 recording internally in the HE40, transfer of content over the network via web browser or FTP. 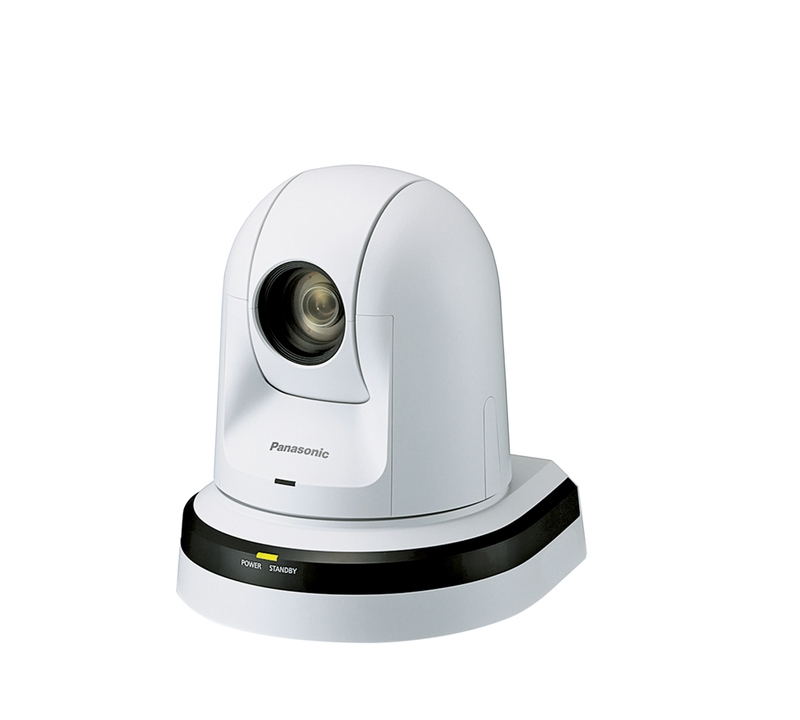 Blend-in: The camera is exceptionally easy to integrate and is available in two colors (-W: pearl white and -K: black matte) to suit a wide range of applications. Ceiling Mount: A twist-lock ceiling mount is included as a standard accessory. Tripod Mount for Mobile Production: The HE40 is also equipped with a 1/4-20 tripod mounting screw receptacle and a safety lanyard for use with many mounting and grip systems. Wall Mount: An optional heavy-duty wall mount is available in either black (FEC-40WMK) or white (FEC-40WMW).